Inner view of the SpaceSim thermal-vacuum test chamber. 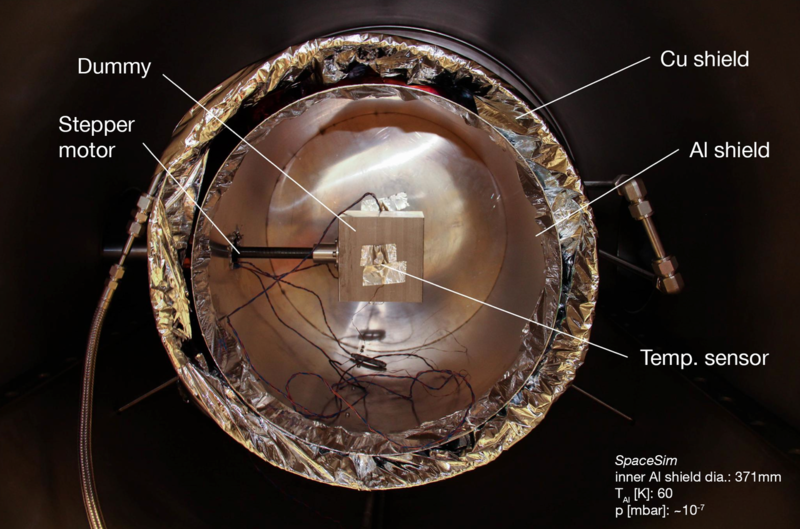 In order to test space components and systems under controlled atmospheric conditions, vacuum chambers capable of cooling the components under scrutiny to a certain temperature are widely used in the space industry. 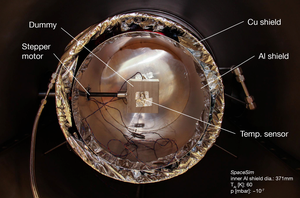 In order to have continuous access to such a facility the thermal-vacuum chamber SpaceSim was constructed for the AFIS project. Housed at the Physics Department at TUM, SpaceSim consists of a vacuum chamber with a volume of 1.5 cubic meters and two cryogenic shields to cool down any device placed inside. Additionally, a stepper motor is available to turn components inside the chamber. It is also planned to add a sun simulator in the future. 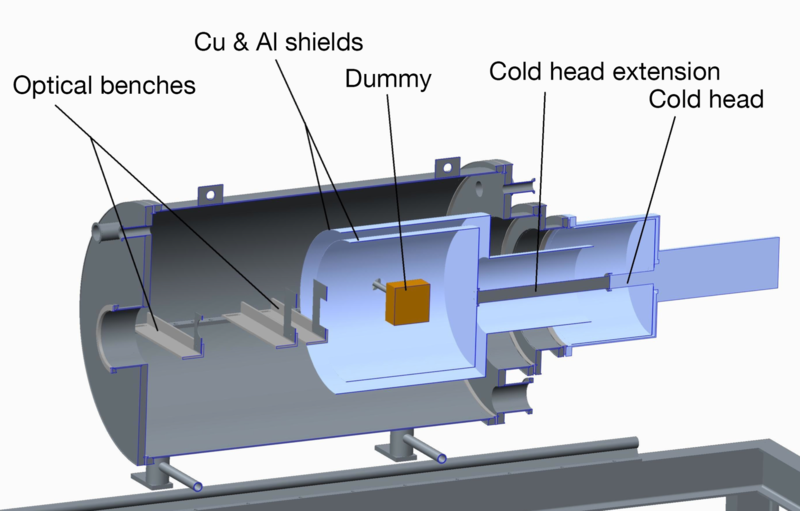 The outer cooling shield consists of copper and is cooled by a continuous flow of liquid nitrogen (LN2) at temperatures below 77 K. The inner shield made of aluminum is connected to the cold head of a cryopump cooled with liquid helium (LHe). The combined cooling power of both shields allow to achieve temperatures on the inner shield of down to 60 K within 20 to 30 hours. To achieve the vacuum required to simulate the space environment, two systems are used in SpaceSim. A conventional turbo pump/backing pump combination delivers a working vacuum in the order of 10-6 mbar, which is suitable for the test of almost all systems. Additionally, if the complete cooling chain is used, the cryo pump and LN2 cooling help to achieve a vacuum of 10-7 mbar or less, depending on the time spent for pumping. Overview of the SpaceSim cryogenic systems.